You are here: Home / Documents and Views of Early Vassar / "Diabolus": "Commencement at Vassar Female College"
Writing in 1873, John Raymond, Vassar's president when the college opened in 1865, revealed that "For the first year, no attempt was made to grade the students by any common standard. It would hardly have been possible to do so, so dissimilar had their previous plans of study been." Accordingly, there were no graduates in 1866, and of course no actual commencement. There were, however, closing ceremonies, and these events were reported in The New York Times on June 28, 1866. The headlines for Diabolus's article. The paper's "Special Correspondent" for the event was the pseudonymous "Diabolus," who wrote briefly—and often breezily—for the Times in the late 1860's. Earlier in the summer, he had written from West Point about the last hours of the "Grand Old Man of the Army," General Winfield Scott. And he had undertaken the "duty by no means pleasant" in early June of covering the "crime, habit and death of one of the great criminals of the world—and greatest of the nineteenth century," the execution of Anton Probst, an immigrant who, on April 7, 1866, had murdered eight people with an axe, near Germantown, Pennsylvania. "Diabolus's" task in Poughkeepsie, more pleasant than his recent ones, seems clearly to puzzle him. He is dazzled by the "large and brilliant assemblage of youth and beauty, wit and worth," he makes "pictures" on the blackboard in "the wretchedly furnished President's room," and he makes lists—of trustees, faculty, and students. Above all, he's astounded by the vastness of Main Building and its elegant engineering. Seeing the "last load of curly-headed students" on their way—before moving on to Newport, where, visiting "The Watering Places" in August he records the nightly "hops" of "The People There—Who They Are and What They are Doing"—he gives a peculiarly effective picture of the energy, hope, and potential in the new college. Poughkeepsie, Thursday, June 27, 1866. Perhaps the reader indulges the absurd idea that a treatise on the necessity of female education is about to follow. No such thing. The thermometer tells a story which would discourage any man from such a task, and if, in this Anno Domini, 1866, there be a solitary subscriber to the Times who doesn't believe with his whole heart in the doctrine of liberal female education, he ought to be ashamed of himself. A courteous invitation from the Committee induced me to to peril life and limb and comfort on the racketty Hudson River road yesterday afternoon, that I might attend the closing exercises of the current year at the Vassar Female College. Concerning the heat and the dust, the noise and the crowd on the cards, there is nothing new to write; concerning the smash-up on the track just below Peekskill, whereby poor Conductor WHEELER and four men lost their lives, and the absolute inhumanity of the Company's people at that station, I will speak further on. Suffice it now to say that we were detained a long time and made very late in consequence. Having reached the college, we were taken to the chapel, where the exercises of the evening were in progress before a large and brilliant assemblage of youth and beauty, wit and worth. Dr. RAYMOND, the president, sat upon the platform where the young ladies read, sang and declaimed, as young ladies only can at such rare and festive seasons. Details one never cares for; all was good. The "papers" were cleverly written and carefully read; the singing was really admirable, and the closing dialogue between Truth, Peace, Discord and a number of angelic friends, was not only instructive, as such matters always are, but likewise entertaining, as they very rarely are. A well-laid collation, consisting of tea, coffee, ice-cream, cake, ices and the substantials, then occupied the attention of the youthful damsels, their friends and the guests of the college until a very late hour, when, with universal good nature and entire satisfaction the congregation broke up, and each person was at liberty to suffer the sultriness of the weather and profit by the gratuitous surgery of the over-zealous mosquitoes. as it has been written on the understanding of one who know all about it from egg to hatchment. "Once there was a very rich and very good man," who lived in this somewhat pretentious City of Poughkeepsie, (with wretched hotels, a great many hills and very few hacks, for which high prices are charged,) who was desirous of doing something with his money while he lived, which would not only redound to his credit after he died, but continue in its career of benevolence and wisdom down through the vistas of futurity. The name of the aforesaid was MATTHEW VASSAR, and his conclusion was the founding and endowment of this magnificent institution, which is not only a monument on his individual liberality but a landmark on the road of progress toward light and liberty in this broad Continent of ours. 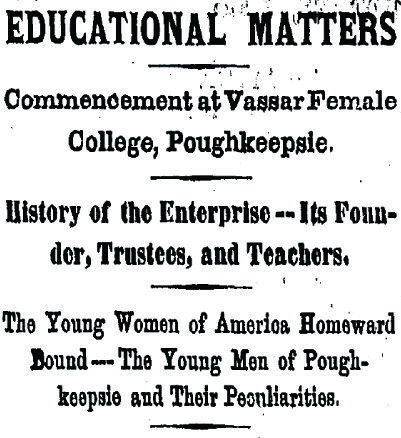 Matthew Vassar, founder of the College, Poughkeepsie. Martin B. Anderson, LL.D., Rochester. Rev. Edward Lathrop, D.D, Stamford, Conn.
Hon. Charles W. Swift, Poughkeepsie. Rev. Elias L. Magoon, D. D., Albany. Nathan Bishop, LL. D., New-York. Rev. Ezekiel G. Robinson, D. D., Rochester. Samuel F. B. Morse, LL. D., Poughkeepsie. Rev. William Hague, D. D., Boston, Mass. Rev. Rufus Babcock D. D., Poughkeepsie. John H. Raymond, LL. D., Poughkeepsie. Hon. Geo. W. Sterling, Poughkeepsie. Hon. Geo. T. Pierce, Ulster County. Rev. Henry Ward Beecher, Brooklyn. James N. Schou, Register and Clerk. After the requisite preliminaries were attended to, the college buildings were erected about two miles back from Poughkeepsie. The buildings in themselves are worth a visit. The main edifice is 500 feet in length by 170 in depth. I contains five independent dwelling-houses for resident officers, beside accommodations for about 400 young ladies and their teachers; with full suites of rooms for class recitations, lectures, music and painting. it also contains a chapel and dining-hall, parlors, and suitable apartments for library, art-gallery, philosophical apparatus, laboratory, cabinets of natural history, and all other appurtenances of a college. It is provided with a perfect system for warming and ventilation, by steam-heated air; with gas manufactured on the premises; with an abundance of pure water, distributed throughout the building; with numerous bathing-rooms, and other needful conveniences. The young ladies' apartments are arranged in groups, three sleeping-rooms usually opening into one study-parlor. By this arrangement society is provided for all, with the requisite opportunity for occasional retirement and privacy. Some of the chambers contain single and others double beds, to suit the different tastes and cirumstances of students. The rooms are neatly carpeted and furnished, and kept in order by the College Matron. They are all airy and cheerful, having on one side a pleasant out-look into the grounds, and on the other opening into spacious corridors, which extend on every floor the entire length of the building and its wings (nearly eight hundred feet) and which, being beautifully lighted, aired and warmed, afford ample means of in-door exercise in inclement weather. The College parlors are large and pleasant; and access can be had by the young ladies at all times to the private apartments of their teachers, and to the homes of the President and resident Professors, without passing from under the roof of the College. The whole main building is nearly fire-proof. Every partition wall is of solid brick, and is carried from the foundation up to the roof. The building is divided across its length by four pairs of fire-walls, from eight to twelve feet apart, which are connected only in the halls, and there by brick and stone. Into the fire-walls are run iron doors, on rollers, and so adjusted that they may be drawn across the halls in case of fire, so that any fifth part of the building my be entirely isolated from the rest. Between these fire-walls run fireproof stairways, which must always be safe. Beside these precautions, at four equi-distant points run water-pipes from top to bottom of the building, with a hose connection in each pipe on each story, and fifty feet of hose always attached to each stop. There are ten external doors and eight stairways from top to bottom. The building is of brick, with slate roof. A spacious boiler and gas house supplies warmth and light to the entire establishment. This building, whose dimensions are 84 feet by 42, is at a distance of 400 feet from the College edifice, and covers three boilers capable of generating sufficient steam for the cooking and laundry service, and to warm all the rooms in the College, even in the severest weather, by means of over 14 miles of steam-pipe, some of it at a distance of 1,000 feet from its source, and water heated by the same agency is carried into all parts of the College. This building also covers two b[r]anches of gas retorts capable together of making 15,000 feet of gas a day, with the necessary center seal purifiers and meter, and room for storing a large quantity of coal. The amount of coal consumed in all the operations is from 1,400 to 1,500 tons per annum. The whole system of steam, water and gas pipes throughout the establishment, measures over twenty miles. The Pump-house covers the water-wheel and steam-pump, by which a copious supply of water is driven from a spring-fed lake to the distributing reservoirs by which it is first cleaned of possible impurities. These, with the requisite farm-houses, barns, vegetable depots, and an ice-house of generous capacity, complete the collection of buildings, which enable this College to challenge comparison with its sister institutions, everywhere, for perfection of material arrangements. It may seem very easy work to tell all this, but it isn't. The information has been derived only at great expense of mental and physical strength. I walked over the farm this hot, broiling day to see the place where 2,000 bushels of potatoes were growing; to the lake where the young ladies row their little skiffs; to the riding school where Baron somebody, from somewhere on the something, is to manage the ménage; to the gas-house where Mr. GATEHOUSE, formerly of DELMONICO's, runs the gas factory and the steam apparatus generally; to the bakehouse; through the labyrinthic cellars, where more pipe is laid than would provide a piece of the pipe of peace for all the Indians this side of Jerusalem; through the art gallery, where a very Elliotian picture of Mr. VASSAR, in a characteristic attitude, near a mat, greets the curious eye, and many beautiful and many not so beautiful pictures; through the cabinets where minerals of all ages, sorts and conditions are arranged, "periodically;" through the music rooms where thirty-one pianos from all "celebrated manufactories are in readiness and tune;" through the laundry, the dining halls, the study rooms, the wretchedly furnished President's room where I made pictures on the blackboard, and finally down into the clerk's office where I met the Treasurer, who did not present me, as I had heard was his custom with all strangers, with a check for $500, bearing at the bottom his graceful signature and ancient coat of arms. consists of a President, ten Professors and twenty-one instructors. Dr. JOHN H. RAYMOND, the President, is a native of Brooklyn and a graduate of Union College. He was for many years a Professor at Madison University; subsequently at Rochester University, and for some ten years prior to his coming here, President of the Polytechnic in Brooklyn. He is ably assisted by Miss HANNAH W. LYMAN, formerly in charge of an institution at Montreal, and a corps of Professors as able as they are experienced. Prominent among them are William I Knapp, A. M., Professor of Ancient and Modern Languages; Charles S. Farrar, A. M., Professor of Mathematics, Natural Philosophy and Chemistry; Sanborn Tenney, A. M., Professor of Natural History, including Geology and Mineralogy, Botany, Zoology and Physical Geography; Maria Mitchell, Professor of Astronomy and Director of the Observatory; Alida C. Avery M. D., Professor of Physiology and Hygiene, and Resident Physician; Henry B. Buckham, A.M., Professor of Rhetoric, Belles-Lettres and the English Language; Edward Wiebe, Professor of Vocal and Instrumental Music; Henry Van Ingen, Professor of Painting and Drawing. The new Gymnastic Department, with a superbly arranged gymnasium, is under the charge of Miss Powell, sister to our very Radical but jolly friend, who edits the Anti-Slavery Standard. There are so many things to be packed, so many dear friends to be kissed, so many autographs to be written, so many little trinkets exchanged, so much to say, and so little time to say it in, that what with the running to and fro of men and servants, the bustling of the young ladies, the excitement among the coachmen and expressmen, and the constant never-ending jabber, jabber, jabber, it's only a wonder that they have been able to get away at all. Load after load is driven off, but the stream of bright-eyed beauties and heavily packed trunks seems never ending. Dr. RAYMOND is a good-natured soul; he has written his back-handed autograph some three hundred times to-day, at the urgent request of the three hundred girls who wouldn't take "tired out" for an answer. As for Miss LYMAN, she was more shrewd, and wouldn't write one. I haven't omitted to notice other things since I came up. Among other curiosities are the young men of some College in the city; they all wear straw hats turned up, with narrow black ribbon, so that one would naturally suppose them in mourning for a very small baby. The few hacks here are notable for their leakage, and their drivers for their high rate of fare. I don't think of any other information that would be of interest in this connection. The weather—thank Heaven for that topic—is so terrible in its constitutional effects upon people here just now that everybody looks as if he or she would be very cross if vacation hadn't come, and I am free to say, that such heat as the sun and water manage together to inflict upon us, is just a touch beyond the temperature afforded Shadrach, M. and A. The last load of curly-headed students has disappeared in a cloud of dust.